Rain showers early with overcast skies later in the day. High 52F. Winds NNW at 10 to 15 mph. Chance of rain 60%..
Navy airman Todd Schneckloth poses in front of the Grumman C1-A prop plane, wearing a borrowed captain's hat, circa 1969. 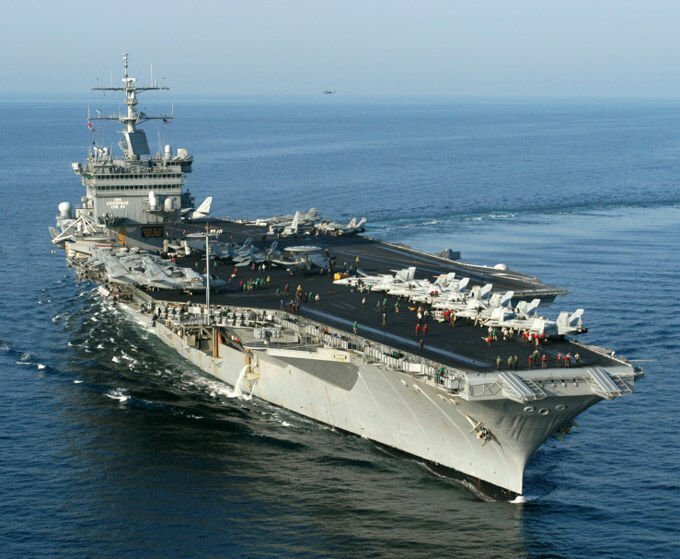 The "Big E" nuclear-powered attack aircraft carrier USS Enterprise, CVN-65. Helena native Todd Schneckloth, of Maple Valley, Washington, served two tours as a Navy fixed wing air crewman during the Vietnam War, stationed on the nuclear aircraft carrier USS Enterprise. Schneckloth survived several close calls during his time serving off the coast of Vietnam in 1968-69. But none were as devastating as an accidental explosion on the Enterprise’s flight deck in January of 1969, while docked at Pearl Harbor, Hawaii. Twenty-seven sailors lost their lives, while another 314 were seriously injured. Fifteen of the 32 aircraft stationed on the ship were destroyed. It took several months to repair the damage, but the Enterprise was back in action later that year. “I (just) thank God for protecting me and my crew during my time in the service,” Schneckloth wrote in an email from his home near Seattle. Todd followed in the footsteps of his father Howard and older brother Frank into the armed forces. Howard Schneckloth had been a U.S. Army drill instructor, master sergeant, veteran of World War II’s Battle of the Bulge and a POW in a German Stalag camp. As a result of his combat and prison time, he suffered from PTSD — when it was still called “shell shock” — and died at the young age of 56. The Schneckloth’s mother, Rowena, had died in 1951, when Todd was just 4 years old. “I remember as if it were yesterday — Frank, (sister) Rita and I stood out in the parking lot of the hospital in Helena,” Schneckloth recalled. “Children were not allowed to enter at that time, so dad brought her to the window and she waved to us, blowing kisses, saying I love you. In 1956, he remarried to Eileen Dolan. Howard Schneckloth had promised his wife that he would send the kids to Catholic school, which he did “with great hardship,” to St. Mary’s Grade School. All three Schneckloth children attended Helena High. Todd wrestled for the Bengals under coach Jack Cohn, and was a member of the tumbling/gymnastics club, with his best friends Dave Lewis and Bill Robinson. He made blue leader in gym class, as well, graduating in 1966. He also sang in the choir and the Star Lighters singing group, and performed with the Blazers rock band. Schneckloth enlisted in the Navy in 1966 on the buddy program with Lewis, while the third Musketeer, Bill Robinson, joined the Army and served in Germany. Schneckloth’s first duty station was at Hawaii’s naval air station, Barber’s Point. Several months later he was selected for the nuclear attack aircraft carrier USS Enterprise, CVAN-65. The Enterprise, which was the navy’s first nuclear-powered carrier, was launched in 1960. Nicknamed the “Big E,” at 1,123-feet it is the world’s longest naval vessel ever built, and housed a crew of 4,600 service members. Schneckloth flew the Grumman C1-A, “a prop job,” and related that since the insignia looked like “CIA” it allowed him to the front of the line more than once. An airman E4, he served as plane captain, and was the only person who could release the plane to fly, regardless of rank. “We flew off the carrier daily in Vietnam to a number of exciting ports of call, including Da Nang, Saigon, Chu Lai and many others,” he wrote. “We carried medevac patients to land hospitals in Vietnam. He also underwent combat training with the M16 rifle, .45 pistol and various other weapons. Among Schneckloth’s experiences, besides the deadly explosion at Pearl Harbor, was the time they were trying to land on the Enterprise in dense fog at night one time. An article in the Oct. 7, 1968, Independent Record stated that Navy airmen Schneckloth, then 20, and Dave Lewis, 19, were both members of the nuclear-powered attack aircraft carrier USS Enterprise, “which had been awarded the Navy Unit Commendation” in recognition of the ship’s performance off the coast of Vietnam. He also wrote about surviving a monsoon in the South China Sea, and being under attack in Da Nang during the Tet Offensive, when he and his crew spent the night in a bomb shelter there. After ‘Nam, Schneckloth was stationed in Norfolk, Virginia, where he spent his spare time working on his classic 1959 Corvette. “A friend who was a captain of a F-4 Phantom was going to take me for a ride that ‘I would never forget,’ but during preflight run up, we encountered a fuel problem and had to scrub the flight,” he related. After his discharge in late 1969, Schneckloth attended Eastern Montana College in Billings, where he earned a degree in science and business. In 1972, he married Linda McLaughlin in Helena — with Dave Lewis among the groomsmen — and the couple went on to have four children: Chance, Trevor, Tyler and Callie. Schneckloth entered the workforce with the Fortune 500 company Pfizer, starting in the sales division. He worked several different job positions, and became a rep trainer in hospitals up and down the West Coast. The family relocated to Southern California from Seattle, where he worked in the company’s division for the treatment of diabetes. His training at Harvard’s Joslin Diabetes Center allowed Schneckloth to be instrumental in setting up medication studies from Seattle to San Diego. In 2006, he retired after 32 years with Pfizer. “They were wonderful years, and the education and people were fantastic,” he said. Curt Synness, a U.S. Navy veteran, can be reached at 594-2878 or by email at curt52synness@bresnan.net. Curt is also on Twitter @curtsynness_IR.